Anthony and I have spent the last few days spring cleaning. It’s always amazing to me how much stuff a couple can gather in a short period of time. So far, we are getting rid of two bags of clothes and four boxes of books. Plus, I’ve been trying to download my personal library just a bit, so I have placed many other books on Paperback Swap. But we will still have work that needs to be done. All of this cleaning reminds me of an anthology I just read, Sweeping Beauty: Contemporary Women Poets Do Housework edited by Pamela Gemin. This collection contains poetry from many of my favorite poets including Jan Beatty, Denise Duhamel, Diane Gilliam Fisher, Allison Joseph, and Judith Vollmer, and as with all anthologies that I read, I was introduced to many new poets as well. Although I do portray working-class/Rust Belt/blue-collar women in my poems, they seldom are working domestic chores. Why is that? I’m not sure — Stealing Dust contains my factory women poems, a sequence I’m rather proud of because we don’t see a lot of factory workers in poetry who are women. But Stealing Dust also contains a poem titled “Canning Season” which talks about my mother’s kitchen in August. In “Splintered” I make a passing reference to laundry on clotheslines, but that is it. Have I deliberately abandoned the traditional women’s world of work at home? (Or maybe it’s because I’m a terrible housekeeper and don’t want to write about it!) I’m not sure, but I do believe it’s something that I need to explore if I am going to continue to write about the working-class world. My grades for the semester are done, and it looks like I will be teaching a creative writing class this summer. So, yes, like everyone, my endings aren’t really endings, but starting points for new beginnings — in my case, new classes, new students, and hopefully, some new work. In the last week or so, I have managed to draft some new poems. I’ve also received a rejection or two. But today, I got the news that Adanna has accepted one of my poems. I loved Adanna’s debut issue that was published last year, so I’m super excited to be included in this summer’s issue. Now, I’m off to prepare for my summer course! With the warm weather and bright sun, it does indeed, feel like summer. Today’s issue of Escape Into Life features poems of mine along with great photography by Mark Cohen. Take a look! I love the rough and tumble look of working class childhood Cohen captures in his work. Special thanks to Kathleen for recruiting my work for Escape Into Life and for talking about Stealing Dust on her blog today! As many of you know, I am in the process of putting my first full length manuscript together. It’s frustrating and daunting, mostly because I want to put all my poems in chronological order (I write a lot of narrative poems). It worked with Stealing Dust, but I know that with a bigger collection, I have more room to play. I’ve been looking at other full-length collections, and I realize that most poets do not place their works in chronological order, even if they write narrative poems. So, now, I have been busy organizing my poems according to theme and tone. That has helped. But then, I realized that certain symbols and images appear again and again. In the past I have mentioned that dead birds show up a lot in my writing, and I have at least four poems in this collection with dead birds. Furthermore, there’s a lot of splinters, dust, makeup stains, cigarettes,and heels floating around in my works. Do these images all go together? I hope so. 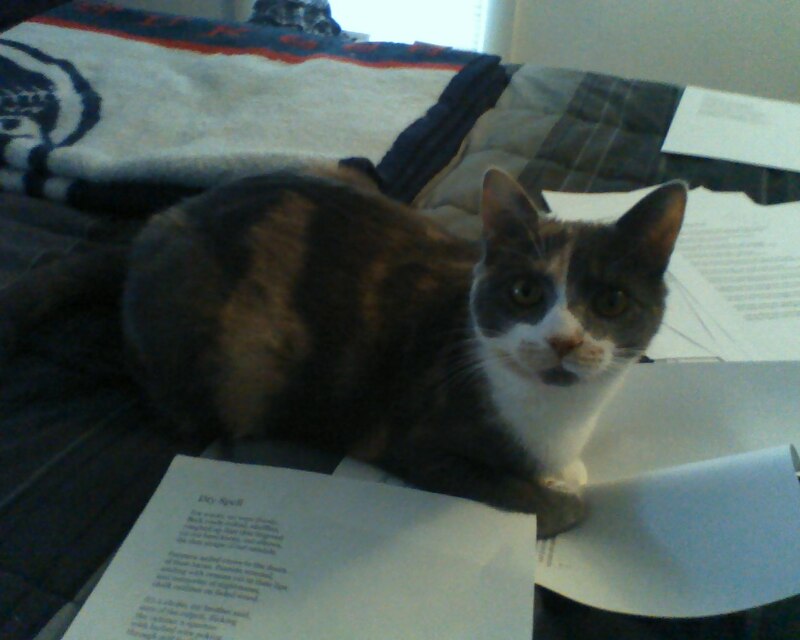 As for the picture above, I promised myself that The Scrapper Poet would not become a “cat blog” but I had to post a picture of Lola helping me compile my manuscript. She likes my dead bird poems. Special thanks to Sherry for her thoughtful review of Stealing Dust published in the latest issue of The Centrifugal Eye (click on page 98 and 99 to see the review). I know how much time it takes to review a collection of poetry, and I’m always touched when my readers take time out to say something (nice or not!) about my work. I’m hoping there will be such a sequel. I had a great time at Bloomsburg this past week. Poet Jerry Wemple was a fantastic host, and I loved meeting his colleagues and students. My reading went well, and I was surprised (but pleased) to see people attend who lived in the surrounding areas. JoAnne was a wonderful reader — so much so that now I have to go back and re-read her book, Red Has No Reason. After the reading, about 10 people (faculty, community members, students) went out to eat and conversation turned towards the surrounding areas. Bloomsburg University is in the middle of Anthracite Coal Country, and I was surprised to learn that I was only about a half hour away from Centralia, a place that has been a subject of both my poems and more importantly, my academic work in working class poetry and history. (Centralia is a subject of many Pennsylvania poems and works of fiction that take place in coal mining countries). Centralia is the famous Pennsylvania “ghost town” that was destroyed by an underground mine fire. Now, destroyed by a fire makes this particular event sound sudden and tragic. Well, the events surrounding the fire were tragic, but the event actually lasted decades, and the town itself was surrounded by more than an underground fire. Centralia was a hotbed (no pun intended) of politics — and its history is very complex. You can read more about this town here. So of course, I had to go exploring. So the morning after my reading I went looking for Centralia. And I have to admit that in spite of Centralia’s presence in such books as Weird Pennsylvania, there was really nothing strange or spooky about Centralia. In fact, if I hadn’t actually been looking for what is left of this town, I would have passed right through it. There’s a few foundations and dead end streets. A few wooden signs marking past street names are nailed to trees. There are some homes there, but I didn’t want to pull over and gawk. I did travel down a few gravel/dirt roads and was greeted by some cracks in the earth and the smell of sulfur, but no open flames and very little smoke. I can’t say that I was disappointed at what I saw. That would be the wrong observation. Instead, I have to say that I was amazed at how the earth reclaims what we have built. Some may disagree with me, but I believe that in a few more decades people traveling on this stretch of road won’t even realize there was a town there.